Standing stately among her peers this lovely Victorian home, the Marshall Slocum Guest House, resides in the Kay-Catherine area of Newport, Rhode Island’s Bed and Breakfast district. A residential area developed in the 1850s at the beginning of Bellevue Avenue. Marshall and Catherine Slocum built it in 1855 when the estate of Henry Bull VI was settled and the land subdivided and developed. Catherine was a direct descendent of Henry Bull I, one of the founding fathers of Newport. Marshall was a pharmacist from Philadelphia and was also handy in the town being known to have moved several buildings nearby. When the estate was settled, the land was subdivided and the neighboring homes were built in the elegant Victorian style of architecture. One other family owned the home prior to being purchased in 1880 by a commercial developer and then donated to a local church for use as a parsonage. It was used as a home to the clergy for the next 80 years. Because of the limited buying and selling for the house, there has been little structural change from its original design. 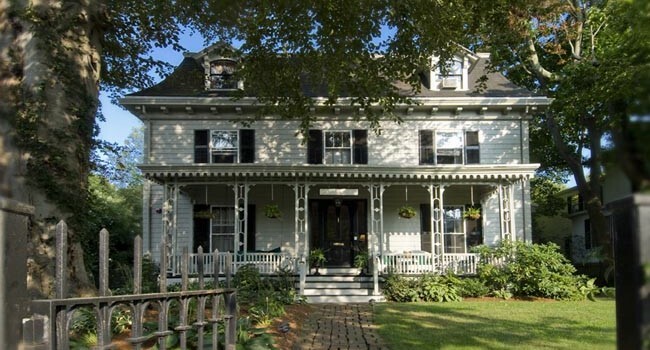 Since its inception as a Newport Rhode Island bed and breakfast in 1983 the house has been painted papered, and pampered with all systems updated bringing her to the level of comfort and charm that she now enjoys. Nestled under a glorious copper beech tree of like age she reflects the beauty of a bygone era. The wicker rockers on the front porch beckon to be used. A short walk from Newport, Rhode Island’s fabled downtown and waterfront attractions and a short drive from the picturesque beaches, our Newport RI lodging is the perfect place to spend your time during your next visit to New England’s most famous seaside city. Whether you come for the Yacht races, the Jazz concerts, or just to relax at the seashore the Marshall Slocum Guest House is the perfect place to stay.